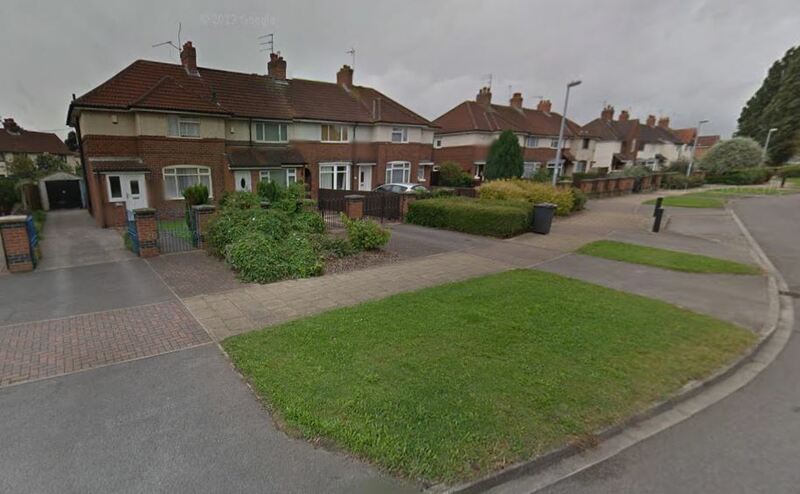 We left Orchard Park in Hull in last week’s post in a bad way, in some ways a typical peripheral estate with what by now seemed the usual problems but in other respects an example writ large in terms of its poor quality design and level of social disadvantage. A further element was introduced by what appeared to be rising problems of criminality and antisocial behaviour. In this week’s post, we’ll examine the ongoing attempts to revive and improve such increasingly stigmatised estates for which Orchard Park was a significant test-bed. It certainly qualified as a hard-to-let estate, a phenomenon identified by the Labour government of James Callaghan in 1978 and then targeted in the Priority Estates Programme (PEP) inherited by the Conservative government which succeeded. Its emphasis was on modelling systems of local management and repair and promoting tenant participation. A growing assumption was also that particular housing forms encouraged crime. There was also some attempt to use the lettings policies in supporting established residents and engineering a more socially beneficial mix of new tenants. The Home Office report captures the contradictions and limitations of such a policy in the face of the intractable realities governing council housing allocations in a period of growing shortage and increased hardship. The report concluded that ‘Territoriality, social cohesion and “empowerment” increased among the residents of the houses’. Among new tenants, the single mothers, generally provided houses (rather than flats), seem to have complemented the more established residents living disproportionately in the estate’s low-rise homes and contributed to their relative low turnover and ‘respectability’. 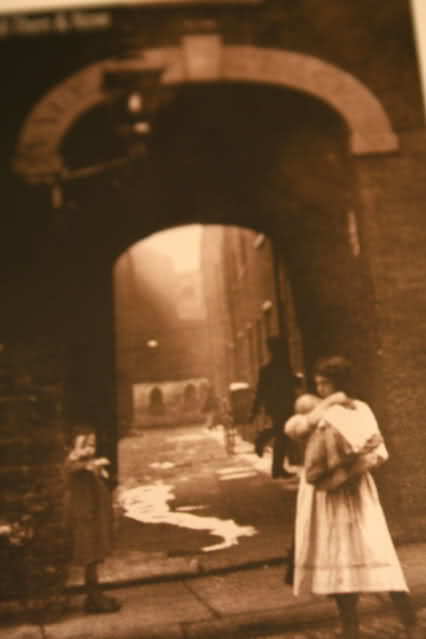 a greater number of young poor people and those discharged from institutional care were coming on to the estates. Their arrival at a time of high unemployment and into conditions of poverty created a destabilising influence, swelled the numbers of vulnerable tenants and encouraged more disorderly activities and lifestyles. Despite a programme of improvement to the security of the tower blocks, and better management of the estate as a whole, the newcomers – that is the young, childless poor – displaced many of the previous, elderly residents and attracted crime to themselves, both as perpetrators and victims, concentrating crime in their part of the estate. It’s all a reminder that council estates are disproportionately required to bear the burden of social and economic problems beyond their purview or, as I would argue, that estates are a victim of societal failings but not their cause. 4. Increasing informal community control over crime both through increased surveillance and supervision by residents and housing officials and facilitating the development of a set of norms and expectations against offending on the estate. That’s a pretty good summary of the ‘design disadvantagement’, ‘defensible space’ theories that were popularised in the UK (and simplified) by Alice Coleman in the mid-1980s though, in Orchard Park (its high-rise blocks notwithstanding), it was applied not to modernist, multi-storey housing but to a generally low-rise estate. Monotonous, unkept [sic] pathways in front of terraced houses were transformed by creating fenced off private yards for each household. A programme of colourful redecoration to external areas did much to brighten the estate’s formerly drab façade. And ‘attractive tiled canopies were erected around the entrances’ of the three Mildane high-rise blocks, ‘creating a pleasing appearance, as well as giving protection from falling objects’. At the same time, entryphone systems were installed and CCTV within lifts and ground floor communal areas, the latter at the time apparently accessible to view by tenants on a dedicated TV channel through a communal aerial, bringing a whole new level to our obsession with crime drama on the box. Nevertheless, Orchard Park remained a ‘problem estate’ into the 2000s even as, of course, it continued to provide a decent home to most of its residents. Of those homes, Right to Buy having wrought its changes even in this apparently unpromising terrain, only around 68 percent were social rented by 2011 with now nine percent let by private landlords. My vision for Orchard Park is that it comes in line with all the other communities in Hull and it’s not singled out, when my son is eighteen and goes for a job he isn’t discriminated against because his postcode is HU6. Orchard Park, created at the tail-end of the long years of estate-building, and at the outer edge of its city as that city started to run out of economic steam, was probably always an estate ‘too far’ – at the problem rather than potential end of the corporation suburb spectrum. In many ways, the Council has acted on that advice. The first three of the high-rise blocks to be demolished went in 2002, including ironically two of the Mildane blocks improved by those ‘attractive tiled canopies’ back in the eighties. The twenty-two storey Vernon House in Homethorpe was demolished in 2004. In 2008, the council began planning the clearance of the remaining seven. I like the flats as they are, I don’t want them changed at all. I leave my door open most of the day but I lock it at teatime … We’ve got beautiful views, you must admit, you get away from everybody, you don’t answer the door if you don’t want to. I would miss my view, I would never go and live in a house and look across at somebody’s back yard. She suggested they reserve her block for those aged over 55, a solution to tower block living adopted in two of the estate’s towers. I was a young girl living in north Hull when this block of flats was built. I remember the new building being celebrated because there was a houses shortage at the time but now it’s demolition is being celebrated. For another, it was an eyesore but he’d miss it on his morning walk. The last of Orchard Park’s high-rise blocks went with the demolition of the Gorthorpe flats in 2016. Meanwhile, Orchard Park and Hull more widely was subject to the initiatives governing housing policy and finance nationally. The Housing Market Renewal or Pathfinder programme laudably aimed to ‘provide lasting solutions for communities blighted by derelict homes through investment and innovation’; its chosen means – which seemed to focus on the demolition of sometimes decent housing and market-led solutions – were far more controversial. In summary, the proposals envisaged the demolition of 752 council houses, 255 privately owned houses, and 33 council bungalows and their replacement with 1020 new homes in the private sector and 680 new homes for social renting. This was a net gain of 660 homes but the figure conceals a net loss of 105 social rented homes. It’s worth pausing – amidst the money talk and statistics – to examine what’s going on here and how powerfully it symbolises the policies and presumptions of the era. Firstly, we have the dependence on private capital – the minimisation of state investment reflecting both a callow political fear of public spending (better understood as investment) and an unquestioning belief in the efficiency and ultimate beneficence of the market. Secondly, perhaps less controversially still, there is the belief in so-called mixed communities (ignoring the fact that estates already accommodate a mixed community) and mixed tenure. It marks a moment when council estates as such were deemed to have failed socially and economically. For all the specific design shortcomings of Orchard Park, we might think it the victim of social and economic failure rather than its agent. And we should certainly question why all these contemporary ‘fixes’ to long-term housing problems seemingly require the loss of desperately needed social rented homes. 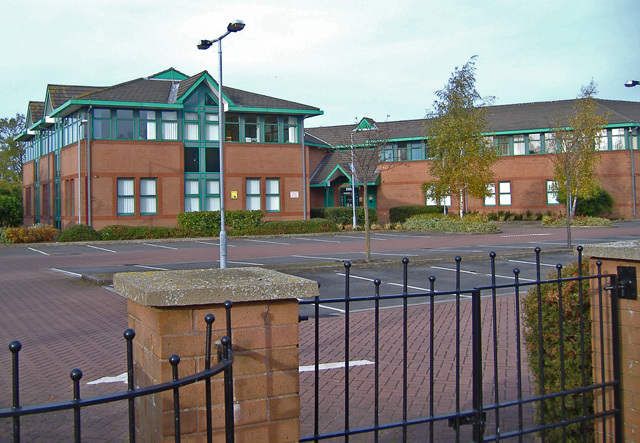 The Orchard Park PFI was awarded £156m in July 2009. In one of the first substantive acts of the new Conservative-Liberal Democrat coalition government, all new PFI schemes (including Orchard Park) were cancelled in November 2010. Given the huge and ongoing expense of the PFI programme and its complexity and troubled implementation, that might seem a relief but it left Hull still scrabbling for finance and dependent on partnerships with private developers or housing associations which could access capital. Nevertheless, some of that has borne fruit in the construction of new homes in the Danepark area and a recently completed scheme in association with Wates and the Riverside Group housing association at Homethorpe creating 52 new homes for rent including 16 one-bed council flats. A major refurbishment programme providing external cladding to the 1668 ‘No Fines’ homes in Orchard Park began in 2016. The Harrison Park extra care apartments for those who need to assisted living are some of the finest in the country. The £14m Orchard Centre (a local council hub and health centre) opened on the southern fringe of the estate in 2009. A new community park and multi-use games area has opened. Remodelling of the run-down shopping centre has made that a more attractive space. I know some people have bad things to say about Orchard Park but we have had no trouble and we brought up our children here. Let’s finish with that – not because Orchard Park has been untroubled or without failings, some of which could have been foreseen and forestalled with greater investment and better design, but because it reminds us it’s been a home to many thousands, usually a good one and, hopefully, an improving one. My thanks to Charlie Baker for permission to use images contained in his report for Urbed, Orchard Park (September 2006). You can find more of his evocative photography on his website. My thanks also to Tim Morton for providing the 1993 PEP report referenced and Keith Jacobs for supplying photographs of the demolition of Highcourt. (7) Crookston, Garden Suburbs of Tomorrow? (10) The Urban Rim website Gateway Pathfinder provides full details. (11) The Urban Rim website also provides a full chronological account of the Orchard Park PFI. 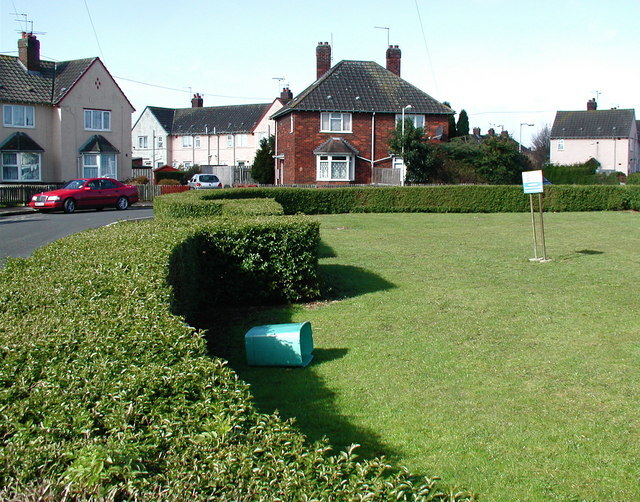 By the early 1980s, Orchard Park in Hull was described as ‘one of the poorest peripheral estates in Britain’. (1) Anne Power was describing its relative affluence – or lack of it – but for many people her words would also reflect a judgment on the quality of the design and build of the estate. The long story of Orchard Park might justify that – it’s a tale of good intentions, poor execution, hostile circumstance and, perhaps in the longer term, lessons learned. In this post, we look at the apparent missteps and failings. Hull had built some 10,700 homes before the Second World War. As a result of wartime devastation – over 1000 hours of raids destroyed 5300 homes outright in the city and damaged almost 115,000 – and the prevalence of the remaining slums, post-war ambitions were even higher. 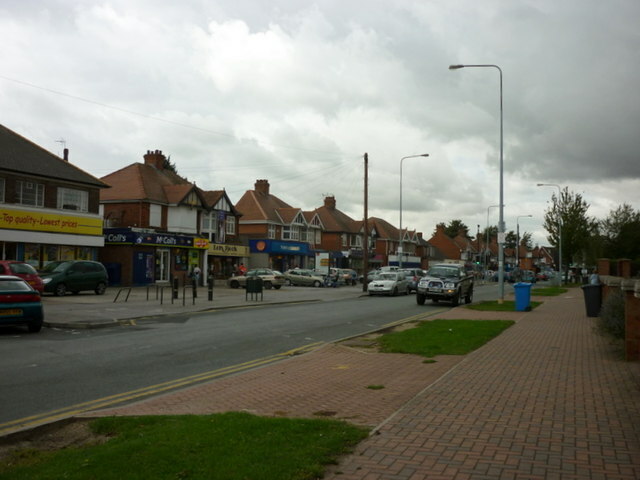 Bransholme, with a planned population of 26,000, was the largest Hull estate (though not, as frequently claimed, the largest in Europe). Orchard Park, with 10,000 residents, was smaller but formed a significant part of the large-scale building programme. Overall the Council built some 35,400 homes in the post-war period and housed, at peak, in 1981 some 47 percent of the city’s households. Planning for Orchard Park, on open farmland on the fringes of the North Hull Estate, had begun as early as 1951 but early proposals were stymied by the conflicting interests of the various local authorities and developers involved. The present-day estate emerged from 1963 under the aegis of City Architect David Jenkin. The estate takes the form of four so-called ‘villages’. 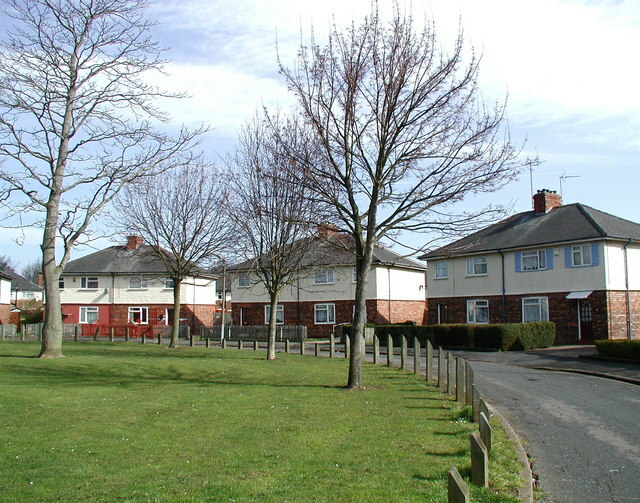 The first, named ‘the Courts’, to the east of North Hull, was completed in 1965 – 764 homes, almost all traditionally built two-storey houses with gardens front and back. It’s said to have ‘always been one of the more popular areas of the estate with a stable population’. (2) The overall layout is a fairly crude form of Radburn with service roads and garaging provided to the rear of homes generally facing grassed open spaces. In many ways, ‘the Danes’ are similar in appearance to old terraced housing – rows and rows of high density terraces, all facing the same way. It is almost as if the design is an attempt to recreate the community feeling of the old slums. Another distinctive aspect of the Danes was the large-scale use of Wimpey ‘No Fines’ housing, built of concrete (with no fine aggregates) cast in situ. The upside of the method was the speed of construction; some 27 ‘shells’ were completed weekly at peak. But there were downsides to which we’ll return. Village 3, the Shaws, was begun in 1965 and finished in 1967. This phase saw a return to traditional, brick construction, carried out by the Council’s own Direct Labour Organisation. The tried and trusted methods applied seem to have ensured this part of the estate remained popular and problem-free. Finally in Village 4, the Thorpes, on the north-eastern fringes of Orchard Park, there were around 500 terraced and semi-detached two-storey houses and some 48 town houses plus three ten-storey towers each comprising 47 one-bed flats. In all, housebuilding was complete by 1969. In contrast, community facilities followed slowly and a promised neighbourhood centre never materialised. A modest shopping centre finally opened in 1974. By then, the estate was already seen as problematic. One issue was the system-built Wimpey ‘No Fines’ housing. As we noted, its speed of construction was impressive but a 1985 report from the Centre for Environmental Studies (CES) described it as having ‘all the hallmarks of a “crash programme”’ – and not in a good way. It had been, they continued, ‘the root of many of the estate’s problems ever since’, unsurprisingly given the issues of condensation and internal rot and mould they refer to. 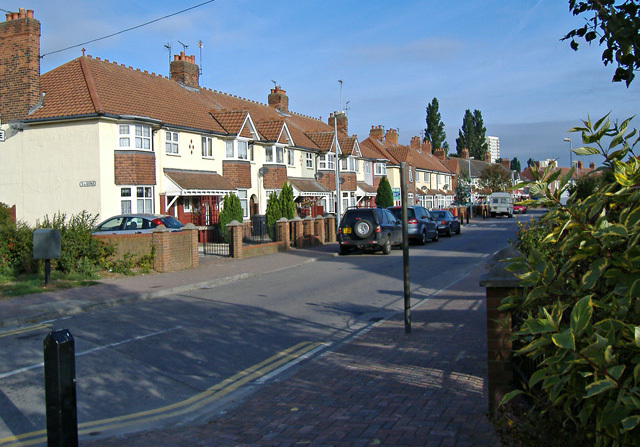 The problem here – as with system-built estates with similar flaws across the country – is not only the obvious discomfort for the residents directly affected but that estates (or parts of them) become unpopular and ‘hard to let’ and come to house typically those with least choice when it came to rehousing, the more vulnerable and disadvantaged of our community. The same CES report also criticised the layout of the Danes, noting the designers’ intention that each of its homes have, in effect, ‘two “front” entrances’, one linking with pedestrian routes, the other to the service areas. This was a version of the Radburn system that existed across most of Orchard Park but, as Martin Crookston concluded, ‘so bastardised a version and so badly done, that the concept’s originators would not even recognize it’. (5) The CES report noted a lack of privacy with pedestrian walkways up against front windows and ‘functionless “open space”, criss-crossed by informal “paths”’. The overall layout has produced a lot of shapeless underused space which has no clear ‘ownership’ as well as a locality with no recognizable shape or sense of place. A walking trip is a long plod through nothing very much, and bus stops on the main loop road … feel as though they are in the middle of nowhere … the housing itself [is] frankly unattractive – boxy little rows running off at an angle to the sweeping over-designed through-roads. This, as he acknowledges, is a harsh judgment on a place many people call home but, superficially from an outsider’s perspective, it’s a hard one to disagree with. By 1981, unemployment in Orchard Park stood at 18 percent. This was four percentage points higher than the Hull average which itself was among the highest in the country. Youth unemployment on the estate was said to reach 80 percent. Ninety percent of tenants were on Housing Benefit, by some way the highest proportion in the city (on the adjacent North Hull Estate, by contast, the figure stood at around 40 percent). If we take larger families and single-parent households as metrics of relative social deprivation (I mean poverty), there too Orchard Park scored highly – almost 11 percent of households had three or more dependent children. There were other indicators too of an estate with problems, seen most powerfully, in housing terms, in the 11.3 percent annual turnover rate for the ‘No Fines’ houses which were only marginally more popular than the estate’s high-rise flats where the turnover rate reached 12 percent. Anne Power’s description of Orchard Park as ‘one of the poorest peripheral estates in Britain’ was more than justified and its associated problems of design and form seemed almost overwhelming. What could change? We’ll take a look in next week’s post. We left Hull in last week’s post standing, figuratively at least, in its civic heart, Queen Victoria Square. We’re looking at municipal Hull – the plans and promises as well as proud accomplishment. Queen’s Gardens, which lie beyond Queen Victoria Square to the north-east, fall somewhere in the middle of that spectrum. The area was once the Queen’s Docks, the first Hull docks constructed in the 1770s. Obsolete by the interwar period, they were sold to the Corporation, infilled and opened (by Labour MP Herbert Morrison) as a park in 1935 and, as such, were a key element of the 1930s’ redesign of the city centre. The fountain at the western end survives from that time but the Gardens as a whole were remodelled by Frederick Gibberd from the 1950s, building on the earlier Lutyens and Abercrombie vision for a new grand civic space, including assembly hall and winter gardens, which incorporated the Guildhall to the south. Those larger ambitions remained unfulfilled and the Gardens remain poorly integrated into the wider cityscape – an issue addressed by a new masterplan issued in 2013 – but it’s a lovely space and walk into them to appreciate some fine past and present landscaping and public art. (1) Amongst the latter are reliefs by Robert Adams by the pond at the eastern end and five panels by Kenneth Carter on a northern wall in front of the 1959 former Police Station, both commissioned by Gibberd (a great patron of public art as we’ve seen in Harlow). What will catch your eye is the grand terminal vista of the Gardens at their eastern end. The Wilberforce Monument (local boy William Wilberforce was the town’s MP from 1780) was erected by public subscription in 1834, just one year after the slave trade against which Wilberforce campaigned tirelessly was abolished in the British Empire, and moved to its present site in 1935. Beyond it lies the Hull College of Technology (now Hull College), designed by Gibberd in Festival of Britain style in the 1950s, but completed in 1962. Old Pevsner didn’t much like it – ‘run of the mill’ it thought – but the new guide is more complimentary of its ‘agreeable symmetry’. A William Mitchell panel – depicting nautical and mathematical instruments – sits strikingly on the building’s façade. From the College head south towards Alfred Gelder Street. Alfred Gelder, an architect by profession, councillor and alderman for 43 years, was another of the nonconformist Liberals who left their progressive mark on the city. The English Baroque-style Guildhall and Law Courts complex, designed by Edwin Cooper, on the street fittingly named after Gelder was begun on the latter’s initiative in 1905 and completed in 1916. It’s a striking presence, monumental externally, lavishly decorated internally: a powerful statement of civic pride and purpose. From here it’s a short walk to the heart of Hull’s Old Town (the new town of the 14th century) and at the top end of the High Street, the city’s Museum Quarter – three excellent museums run by the council and free to enter. Wilberforce gets due recognition in the house, now museum, where he was born and grew up. But a shout-out here for the excellent Streetlife Museum which offered a great combination of transport and social history – and a chance, keeping to my municipal theme, to take a photograph of a Hull Corporation tram of pre-First World War vintage. The trams were municipalised in 1896, converted to a trolley-bus system in 1945, and finally closed in 1964. Walking further south along the River Hull, you come to some impressive infrastructure – Myton Bridge, a swing bridge carrying the A63 opened in 1980, and the Tidal Surge Barrier of the same year designed by Oliver Cox. Cox made his name as a major figure in the housing division of the London County Council’s Architects Department so it was impressive to see the versatility displayed in this later work. Further on is The Deep, designed by Terry Farrell and completed in 2002 – an aquarium and major visitor attraction intended to regenerate this redundant area of former dockland. Finally, on this perambulation, you can stop off for some well-earned refreshment in the revitalised Fruit Market area around the corner on the eastern side of Princess Docks. Now rebranded as an arts and cultural quarter, not so long ago it was just what it said it was as some of the surviving shopfronts and signs on Humber Street testify. The Gibson Bishop building on the corner – once a fruit and vegetable merchant and now Thieving Harry’s café – is another fine example of 1950s’ reconstruction. All that represents a full day’s visit but, hopefully, you’ll take time to explore the city further. I’ll conclude with another idiosyncratic, municipally-themed, selection of other highlights. Heading east along the Holderness Road, you’ll find the James Reckitt Public Library (Reckitt was another local philanthropic Liberal industrialist), designed by Alfred Gelder and opened in 1889 as Hull’s first public library. Immediately adjacent are the more exuberant East Hull Baths, designed by Joseph H Hirst, then of the City Engineer’s Department, and opened in 1898. A little under a mile further east, you reach the edge of the garden village developed before the First World War by Reckitt for the workers of his nearby works. It’s a beautiful ensemble though now, for the most part, firmly for the more affluent middle classes. The sweetly-named Frederick I Reckitt Havens, run by Anchor Housing, remain a not-for-profit enclave for elderly persons. Next is East Park, originally 52 acres, now 120, designed by Borough Engineer Joseph Fox Sharp and opened by the Corporation in 1887. The Khyber Pass folly was constructed, possibly as a project for the local unemployed, between 1885 and 1888. Not the worst reminder of Britain’s imperial past perhaps. Alternatively head north along the Beverley Road, there are more examples of progressive municipal endeavour – the Stepney Primary School, a Queen Anne-style building of the Hull School Board erected in 1886 and, next door, the Beverley Road Baths, designed by Joseph H Hirst, again, in 1905. Further north along Beverley Road is Britain’s last surviving Second World War Blitz site. The National Picture Theatre, a 1914 cinema, was bombed in 1941 and has remained largely undisturbed since then as an unintended memorial to wartime destruction. There are now plans to resurrect the listed building as a formal commemoration of the era. Pearson Park just to the west, originally the People’s Park, opened in 1862 – the city’s first public park – is a superb example of Victorian concern for working-class wellbeing and healthy recreation (even while the latter didn’t generally extend to their profit-making working lives or usually squalid homes). The poet Philip Larkin’s home, another of the recently listed sites, is an attractive middle-class residence of the 1890s on the northern edge of the park. Larkin was famously chief librarian of Hull University which lies off Cottingham Road to the north. If you cut across west from Beverley Road, you can take in another of the Hull Board’s fine schools, that on Sidmouth Street, erected 1912 and designed by the industrious Joseph H Hirst. Across the road and on Exmouth Street nearby you’ll see some rare surviving examples of the court housing – short facing terraces built as cul-de-sacs off the main roads – which dominated much of the city’s working-class housing before the First World War. These are later, and better built, examples from the 1880s. One of the residents we spoke to was pleased that a couple of people up from London had ventured beyond the city centre. On to the University and we’ll stretch a point here – though not too far – to make this our final example of municipal investment and innovation. The University was founded in 1925 on the back of a £250,000 donation from Thomas R Ferens and a £150,000 grant from the City Council. There’s a lot of good architecture to be admired here but I’ll give you the Venn Building of 1928 (‘Neo-Early Georgian’ according to the experts) designed by William Forsyth to capture these interwar origins. And that’s it. I’ve done a bit more than scratch the surface but all this is only really a taste of what Hull has to offer and a poor substitute for a visit in person. Above all, it’s a reminder of the huge and important role that local government – as well as a broader civic culture supported by progressive actors – has played in the building and civilising of our cities. Hull’s deserved status as the UK’s City of Culture in 2017 marks a later iteration of this same endeavour and I hope that the investment and interest it has attracted genuinely improves the lives of local residents as well as entertaining mere visitors such as myself. I’ll end with a plea that this revival of municipal dreams is an exemplar, not a one-off – a testimony, like so much of what went before, to how a properly resourced and ambitious municipality can improve the lives of its citizens. Much of the architectural detail in this post is drawn from the invaluable Hull (Pevsner Architectural Guides, 2010) by David and Susan Neave. (2) The website British Post Office Buildings and their Architects: an Illustrated Guide has informative description and illustration on Hull’s General Post Office. (3) For fuller detail on all the new Hull listings, take a look at the Historic England webpage. (4) Of course, the issue of public conveniences (or present-day inconvenience) isn’t merely a matter of historic or architectural interest. The provision of public toilets was an important part of municipal service in its earlier years and the withdrawal of such provision is a major concern to many sections of the community now. This is well dealt with, past and present, in a Hull context, in Paul Gibson’s post on Public Toilets in Hull. Jones the Planner offers a full and more critical perspective on Hull’s post-war planning and architecture in ‘Hull: City of Culture’ (9 February 2014) and, alongside other case studies, in the book Cities of the North (2016). Hull, as I hope you all know, is the UK’s City of Culture for 2017. You really don’t need an excuse to visit the city but, if that’s an incentive so much the better, because it’s worth it – Hull is one of the friendliest and most interesting places I’ve been to in a long while. 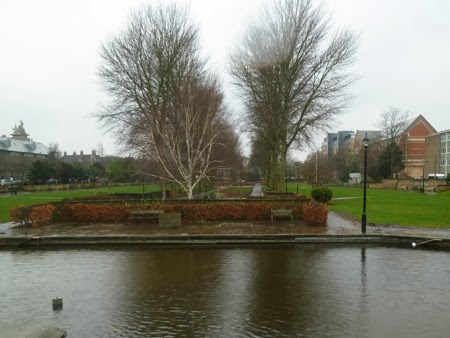 What follows – touching on the city’s civic planning and an eclectic mix of some of its municipal highlights (I’ll do some housing stuff in future posts) – can only be an appetiser but I hope it will encourage you to explore the city for yourself. This first post looks, in particular, at twentieth century plans to reconstruct the city. Hull’s been a borough since 1299 and you’ll see some very early town planning in the grid-like pattern of streets off the High Street in the Old Town. These were added to the original riverbank settlement by Edward I who wanted the prosperous port as a base for his forays against the Scots and who renamed it formally Kingston upon Hull in the process. The port – it was the UK’s third largest into the 1950s – and its associated industries expanded massively in the centuries which followed. By the end of the nineteenth century, the Council – a reformed municipal corporation in 1835 and a county borough from 1888 – desired a civic presence which reflected the town’s importance and prosperity. In the interwar period, new ambitions emerged to improve the city, a typically squalid product of breakneck Victorian-era urbanisation, as a living and working space for its broader population. And then the Blitz – which hit Hull harder than any British city outside London – added its own necessity and aspirations to the task of post-war rebuilding. To be honest, there’s not much to vindicate such hopes now but look north to the junction with Brook Street and you’ll see a vestige of them in Brook Chambers, erected in 1934. In the event, wartime devastation – almost half the city’s central shops were destroyed – created new urgency and new opportunity to rebuild on a larger scale. Planning for ‘this second refounding of the great Port on the Humber’ began in 1941 and were finalised by 1944, commissioned by the Council from the two foremost town planners of the day, Sir Edwin Lutyens and Professor Patrick Abercrombie. (2) Lutyens had spent almost twenty years designing New Delhi; Abercrombie drew up influential post-war plans for London and Plymouth amongst others. Although Lutyens died in January 1944, his imprint on the completed Plan for the City and County of Kingston upon Hull seems strong in the grand Beaux Art scheme devised though it’s a form also favoured by Abercrombie in Plymouth. the three great themes of post-war planning in Britain – inner city redevelopment; commitment to the social ideal of neighbourhood planning; and the trilogy of Containment – Green Belt – New Town. A satellite town was planned in Burton Constable eight miles to the east with a narrow Green Belt separating the new settlement from the Hull suburbs. Neither emerged and the new centre planned, in Abercrombie’s words, as ‘something completely new in Shopping Centres’ – ‘a highly specialised precinct, free from traffic but adjacent to the central traffic routes’ – also took a very different form from that originally envisaged. Abercrombie and Lutyens had hoped to create a new shopping centre centred on Osborne Street, adjacent to an expanded and re-formed civic quarter located around Queen’s Gardens. Established business interests and the prevalence of surviving buildings – despite the Blitz – stymied this vision. The alternative Chamber of Trade plan keeps a revamped shopping centre to the north. With thanks to Catherine Flinn. The Chamber of Trade Plan – first mooted in 1947, drawn up by another eminent town planner, WR Davidge, and adopted in modified form in 1954 – was constructed on the foundations of the main existing shopping centre to the north and was seen as far less disruptive. 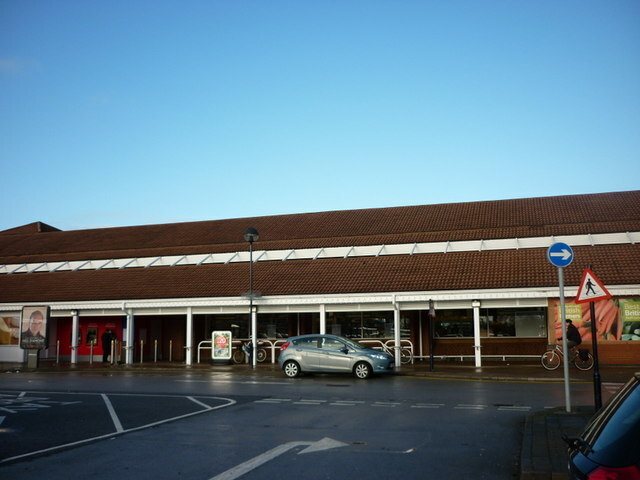 It incorporated ‘temporary shops’ on Ferensway which survived until 2013. Temporary shops on Ferensway. With thanks to Catherine Flinn. Nevertheless, the rebuilt streets that emerged offer an impressive testimony to the vision and design aesthetic of post-war reconstruction, most notably in the House of Fraser department store (originally Hammonds) on Ferensway and Jameson Street. Designed by TP Bennett and Sons and opened in 1950, it’s commended by the new Pevsner for its unusual combination of 1930s and Festival of Britain architectural elements. Like a number of businesses in the vicinity, it seems to have suffered from that later iteration of our commercial future, the indoor shopping centre, but the building itself remains, to my eyes, strikingly attractive. Across the road is a bit of more standard post-war neo-Georgian but, if you look very carefully to the bottom right of the image above, you’ll catch a glimpse of Tony, a local bus driver playing the spoons and giving a one-man band show before starting his shift. He wasn’t busking. As he told us, it was just a way of cheering people up and putting himself in a good frame of mind before work. He gave us a brilliant introduction to Hull and its people. Just along Jameson Street is Festival House where a tablet marks it as ‘the first permanent building to arise from the ashes of the centre of the city’ after its wartime destruction. If you’ve just arrived, the telephone box in the centre of Jameson Street might be the first of Hull’s famous cream-coloured kiosks you’ll see. This one looks like a Gilbert Scott’s K6 1930s’ design to me but experts can correct me. The unusual colour (and lack of crown insignia) isn’t an affectation but a proud reminder that Hull Corporation inaugurated its own municipal telephone system in 1902 which remained free of General Post Office control and privatisation until finally sold off in 1999. Hull’s telephone and internet services are now operated by Kingston Communications which controversially retains an effective local monopoly. Walking on, there’s a mix of styles and ages until you come to South Street on the right where you meet Queen’s House, a huge neo-Georgian quadrangle occupying one whole block of the city centre, designed by Kenneth Wakeford and completed in 1952. The photograph, of its Chapel Street frontage above, hardly does it justice but it does capture the decline of a commercial district which Abercrombie hoped would restore Hull to its pre-war eminence as a centre serving some 500,000 people. By this time, you will have spotted what should be one of Hull’s most proudly iconic images – Alan Boyson’s Three Ships mural, completed in 1963 and commissioned by the Co-op to celebrate Hull’s fishing heritage. The stats are impressive enough – it’s an Italian glass mosaic of 4224 foot square slabs, each made up of 225 tiny glass cubes affixed to a 66ft x 64ft concrete screen – but what I love most is the confidence of its bravura statement of local identity. And I love that it was commissioned by the Co-op, reminding us of a time when that organisation’s consumerism with a conscience (and its ‘divi’ for its working-class members) occupied centre-stage in the drive to build a fairer and more democratic Britain. The Co-op moved on; the premises were taken over by BHS and it went bust in 2016. The building now offers a ‘redevelopment opportunity’ but, whatever happens, please support the campaign to preserve the mural by following @BhsMuralHull on Twitter and signing the petition for listing. From here, a right turn down King Edward Street takes you to the heart of civic Hull into Queen Victoria Square, created in 1903 some six years after Hull was granted city status. The 1903 statue of Victoria sits imperiously above some fine public toilets, added in 1923 and retaining their original earthenware stalls, cisterns and cubicles in the Gents. Unless you’re desperate (and male), they probably won’t be the first thing you notice. On your right, stands the Edwardian Baroque City Hall, designed by City Architect Joseph H Hirst, opened in 1910. This was designed as a public hall for concerts, meetings and civic events; on the day we visited it was hosting a graduation ceremony for the University. Across the Square lies the Ferens Art Gallery – a ‘simple restrained classical cube of fine ashlar’ in the words of the latest Pevsner. It was completed in 1927 following a £50,000 endowment from Thomas R Ferens, a director of Reckitt’s (one of the city’s major firms) and one-time Liberal MP for East Hull. One of several significant benefactors to the city, Ferens was honoured after his death in 1930 in the naming of Ferensway. An artwork purchased by the Corporation, one of many. The early support of the Council is clear too among the many fine works on show. The Gallery, free to enter, with some good temporary exhibitions while we were there, is well worth a visit. The civic triumvirate is completed by the Maritime Museum facing which was originally built in 1868-71 as the headquarters of the Hull Dock Company – a rare British building by Christopher George Wray who had made his name as an architect for the British Government in Bengal. Both the dock offices (they became a museum in 1975) and City Hall were scheduled for demolition in the Lutyens and Abercrombie Plan as part of its creation of a new civic quarter – one reason perhaps, despite Abercrobie’s recognition that a ‘clean sheet approach’ would not be welcomed, why the major part of the Plan went unfulfilled. Next week’s post continues this tour of Hull, looking at other elements of post-war replanning as well as some of its major municipal accomplishments in the city centre and beyond. And, if you’re new to the blog, I’ve written on the North Hull council estate in an earlier post. (1) Blomfield is quoted in ‘Slums Cleared for New Cityscape’, BBC Legacies, UK History Local to You (ND). The latter quotation is from David and Susan Neave, Hull (Pevsner Architectural Guides, 2010). Much of the detail which follows is drawn from the same, invaluable, source. (5) The first quotation comes from Abercrombie himself. The second and further detail comes from Jones, ‘“…a fairer and nobler City”. My thanks to Catherine Flinn for providing some of the images specified as well as supporting detail. Her book on post-war city centre reconstruction in Hull, Liverpool and Exeter will be published next year. As we saw in last week’s post, Hull had acted energetically in building homes and clearing slums after the First World War but the impact of a second would require it to redouble its efforts. 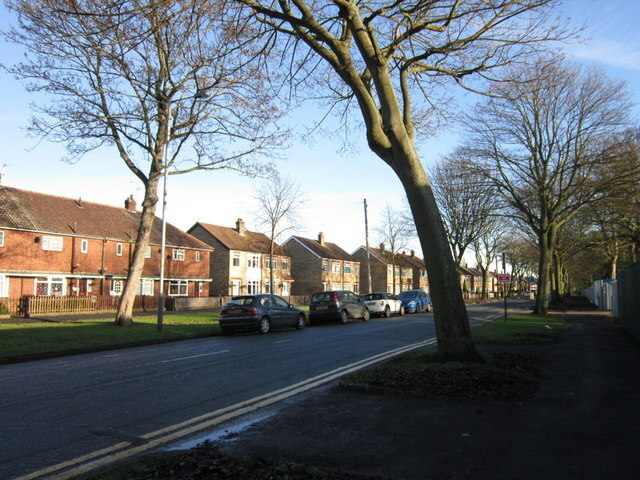 New estates were built on its northern fringes which made the original North Hull Estate seem rather old-fashioned – a good or bad thing according to taste. Certainly, the Estate was ageing and subject, in recent decades, to the difficult transitions that have affected much of our council housing. This, and a conjuncture of the ambitions of politicians national and local, would combine to make the Estate the nation’s first Housing Action Trust in 1991. 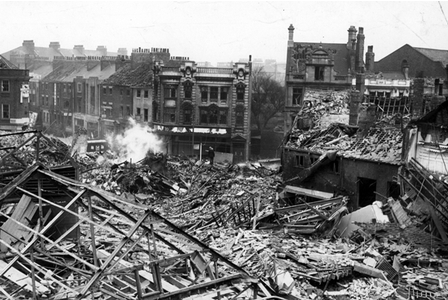 The strategically vital city of Hull suffered more damage from German bombing than any other in the UK except for London – over 1000 hours of raids destroyed 5300 homes outright and damaged almost 115,000. In fact, it was estimated that only 6000 homes had emerged unscathed. 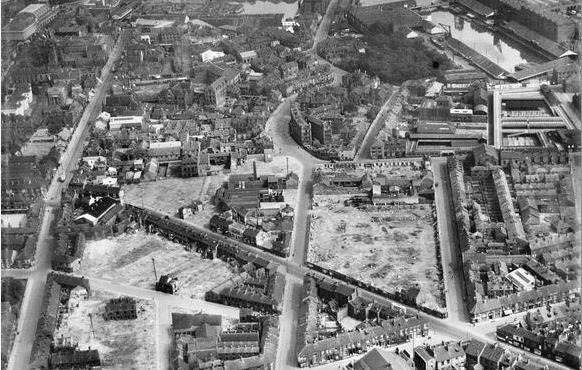 (1) Nor did suburbs such as the North Hull Estate escape this destruction – bombs not dropped on port or factories were jettisoned over outlying areas to ease the bombers’ return to base. Early efforts focused necessarily on emergency measures – by 1948, 2525 temporary homes had been created in the city and repairs and rehabilitations returned a further 2720 bomb-damaged homes to use. North Hull was complete before the war but 111 flats and bungalows were built on the estate in the early post-war years – infill development where bombing had destroyed existing homes. 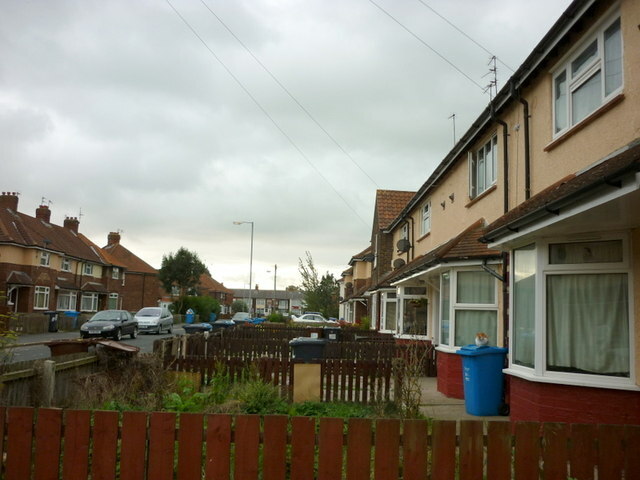 In due course, much larger building schemes – in what was seen in the 1960s as a final push to solve the problem of the slums for once and for all – would affect Hull’s northern suburbs. In the late-sixties, the Council embarked on the construction of the Bransholme Estate on the north-east fringes of the city – not the largest council estate in Europe as sometimes claimed but, with a population of 30,000 on its completion, very large indeed and a very different animal to the garden city that Luytens and Abercrombie had earlier envisioned. The smaller Orchard Park Estate, adjacent to North Hull, was begun at around the same time. It was built, according to the latest town planning principles, on Radburn lines, using cul de sacs, feeder roads and walkways to separate cars and pedestrians. Both estates would suffer problems as they matured which we’ll examine in future posts. Of course, the housing stock was ageing and its facilities increasingly old-fashioned in an era when, so it was said, ordinary people had never had it so good. Belatedly, in 1974, a major refurbishment took place, intended, as one resident recalls, ‘to bring the area back to the glory of the old days’. ‘It worked for a while,’ she concluded, ‘but the shops never got back to what they had been before’. The Coop closed shortly afterwards. North Hull’s reputation declined as it – and the broader local economy – fell on harder times. As council housing allocation policies shifted in the later seventies, the Estate (in the words of one observer) was ‘used to rehouse homeless people or single mothers’. The stigma implied is unwarranted but it marks the shift in the role of council housing – and more so of perceptions of its role and residents – characteristic of recent decades. A 1991 survey showed 70 per cent of tenants in receipt of housing benefit and one in five of the economically active population as unemployed. Almost one in three of residents were over 60. Outsiders see North Hull as a difficult area, they concentrate on marginal matters, drugs and the like, and fail to recognise this is a stable community. Mothers live next to daughters, and nobody wanders too far…Some people see this as an indication of a lack of adventure. I wouldn’t, I would see it as a symptom of stability. We have a tradition of strong women on the estate, neighbourhood ties and family ties are strong. Maybe one of those strong women was the ‘weeping female’ noted in last week’s post who had once so embarrassed poor Mr Whitby. Further repairs and refurbishment began in the mid-eighties and almost half the Estate’s homes had been improved by 1989. Hull City Council – the landlord of around half the city’s homes by this time – was anxious to complete the job but running out of money. It needed £50-60m to complete the work but the Conservative government refused funding under the Estate Action programme. It did, however, indicate that money might be available under a new scheme it was keen to get off the ground, the Housing Action Trust (HAT). The first attempt to launch a HAT had been rebuffed by tenant activism in the Hulme Estate in Manchester and they were anathema to most Labour-controlled authorities as they required that the council cede ownership and control of its housing to an independent corporation. But in Hull (where Labour held 57 of 60 seats on the local council), the Government met a man who wanted to do business. Ironically, given the ideological intent which underlay the HAT programme, Steven Tiesdell sees the result ‘as a demonstration of loyalty to the local authority’. To other tenants, it came down to ‘a straight issue of whether you wanted your house done up in five years or twenty years’. North Hull thus became the first HAT. It comprised 2436 dwellings (the half not previously refurbished): 2109 council-owned and 327 owner-occupied. Apart from mandatory structural repairs, tenants were empowered to choose from a ‘menu’ of home improvements which included such things as rear porches, french windows, wall lights and higher-quality kitchen units. An average of £31,000 was spent per property. Streetscapes and the local environment were improved. There were also various programmes – familiar from later iterations of ‘regeneration’ – to raise residents’ health and ‘self-esteem’ and increase employability through training and education. The HAT was wound up in 1999. Though residents complained about the lengthy disruption imposed by the refurbishment programme, most seem pleased with the results. North Hull was improved – after all, adequate resources combined with a proper respect to tenants’ wishes and interests can achieve quite a lot. But it wasn’t transformed – it wasn’t one of the ‘worst estates’ (supposedly targeted by the HAT programme) in the first place and it continues to exist in social and economic circumstances which determine the life chances of its population as they do – for good or ill – the rest of us. When tenants voted for their new landlord, 48 per cent elected to return to the City Council (down from 86 per cent in 1991) and 33 per cent to join one of a range of local housing associations. The rate of owner occupation increased from 14 per cent to 18. So, the story of council housing in Hull continues. We’ve moved some way from the heady days of the interwar period when cottage estates such as North Hull seemed so obvious and vital a solution to the housing needs of the people but we can learn from them and should continue to build on their legacy. The cottage estates were, and are, garden suburbs. The best of them already show this country’s twentieth-century architecture and planning heritage at its most appealing and successful. Their next 100 years should be based on reinvigoration, and a celebration, of that birthright. (2) Jones the Planner, Hull: City of Culture offers an excellent overview and insight into all that Hull offers despite – or possibly because of – this omission. There was a time when the Quadrant area of northern Hull was known as ‘the Queen of the Estates’. Mind you, there were others, less respectfully, who called it ‘Corned Beef Island’. 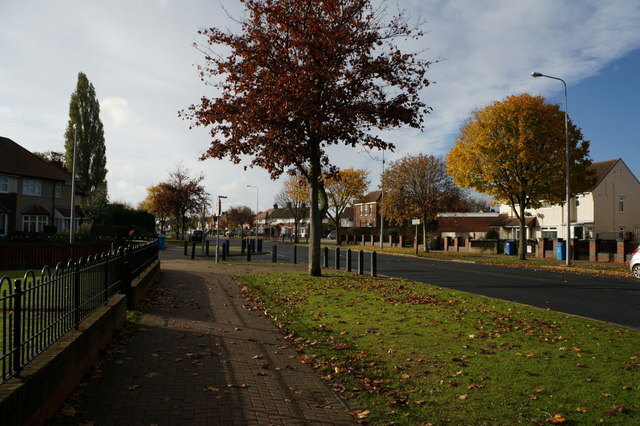 It formed the kernel of what became the North Hull Estate – the largest in the city as council housing expanded massively in the interwar period. Let’s tell its story. the ‘terrace system’…a short blind court usually 18 to 20 feet in width running from the main street. The narrowness of the court and the practical absence of gardens back or front make it possible to have as large a number of people per acre as is practicable without resort to tenements or back-to-back dwellings. The Corporation did relatively little to tackle the problem of the city’s insanitary slums until its hand was forced by an outbreak of scarlet fever in 1881 and a prolonged crisis of infantile diarrhoea, peaking in 1911. It was the war, itself, which would radically alter aspirations and expectations. The rise of the local Labour movement added pressure. The first candidates of the local Trades and Labour Council had been elected to the council in 1902. After the war the Labour presence grew until the Party took control of the council in 1934. By 1939, Hull had built 10,700 council homes – around 42 per cent of all new homes in the city. Back in 1920, Hull’s Medical Officer of Health had estimated 5000 houses were needed to meet wartime arrears and another 2778 required to rehouse those currently living in the slums. The Council made a modest start under Addison’s 1919 Housing Act – 518 houses were built, mostly in new estates on the eastern and western fringes of the city. 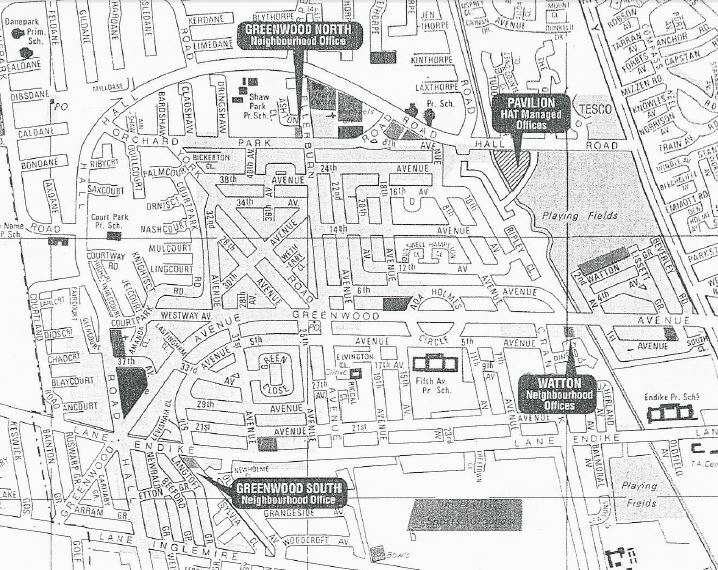 A smaller number were constructed on Greenwood Avenue – the beginnings of the North Hull Estate and, until incorporation in 1935, beyond the then city’s northern borders. Construction was still under way as those first tenants moved in. In 1923, ‘the roads were not even completed and were muddy tracks. There were stacks of bricks everywhere and wooden scaffolding poles lay haphazardly across the pathways’. The nearest shops were a mile and a half away and it was the lack of shops and the difficulty in buying fresh food which gave the area its other nickname in these early years, ‘Corned Beef Island’. Still, travelling tradesmen arrived to make good the deficiency – the rural setting ensured fresh milk from local farms, at least – and later residents recall a bustling range of shops, anchored, as was typical on these new corporation estates, by the local Coop. My mother tells me because the houses all looked the same, on the first day we reached here they found me sitting on next door’s step crying. I couldn’t find our house. This was a youngster whose family had moved to the estate from New George Street in 1933 ‘on the back of Fred Ollet’s coal cart’. That move – and many more in the 1930s – marked a new phase of North Hull’s development. The 1930 Housing Act prioritised slum clearance and the rehousing of those who lived in them. Hull had anticipated this shift – the New George Street clearance had begun in the mid-twenties – but a 1930 scheme planned to demolish and replace a further 3445 houses in the next five years. 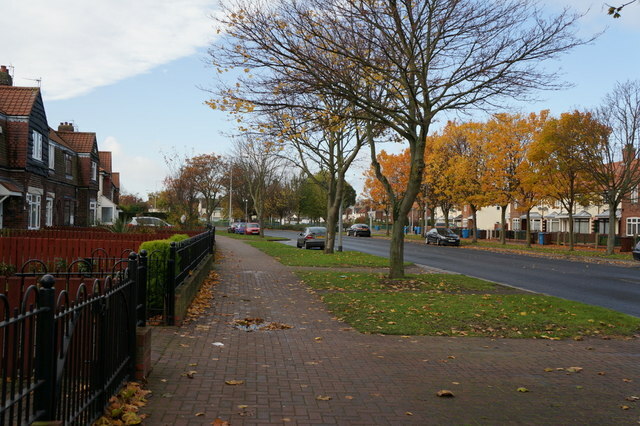 Over 2000 new homes were built on the North Hull Estate in consequence. Endike Lane’s no good to me, mister, it takes all our time to pay 4/6 rent and tram and bus fares to King George Dock. Still, given the nature of Hull’s workforce in this period – around 9000 men worked on the docks, 9000 in chemicals and oils and 5000 in the fishing industry – it was inevitable that a significant number of council tenants did work in the town’s traditional sectors. Many of the Quadrant’s residents worked in the St Andrew’s Fish Docks and the Corporation ran special buses with wooden slatted seats to bring them back from their work in the evening; buses with upholstered seats were put back into service after 6.30 when less fragrant passengers took over. The other perceived problem – for the Council, at least – was an alleged slum mentality: ‘The “slummy” heart cannot be altered, they say’. Mr Whitby, the council officer who reported this widespread sentiment, went on to describe many examples of those moving from the slums who had ‘made good’ – others might have asserted their respectability in the first place, of course. Nevertheless, he advised new tenants be given ‘proper instructions on the proper way to treat the houses’ to make sure that ‘the old slums do not disappear only to give place to new ones’. We had a tenant in a slum area who did not want to leave a ‘hovel’ for a new flat because of family associations. Upon pointing out the advantages of the new house, I was accused of being without any sentiment and the lady in question shed copious tears. For poor Mr Whitby there was ‘nothing more embarrassing than a weeping female on your hands’ but then he hadn’t the benefit of having read the later sociological works describing the powerful matriarchal support networks of traditional working-class communities. (8) In time, as we shall see, these would be replicated on the North Hull Estate. The wise head appreciates the fact that the Corporation are ideal landlords, he gets good value for money, security of tenure and that freedom from neighbours’ annoyances that even the house-owner cannot always be assured of. For all its heavy-handedness, that – when some commentators are so disparaging of council housing and council tenants – is a comment we can savour. The idea that council homes gave their earlier residents a better environment than even owner occupiers might enjoy is worth emphasising. On the other hand, the Council – ‘ideal’ or otherwise – was a rather unimaginative landlord. Homes on the Estate were repainted externally every five years – the windows always cream and doors either blue, maroon or green; twelve houses were painted one colour, the next twelve another. Internally, the colour scheme was always magnolia, distempered walls and brown doors, frames and skirting boards. Kitchen walls were painted brick and remained so until a major refurbishment in the 1970s. Other facilities sound similarly basic to modern ears but back in the day they were the ‘mod cons’ of a good home and, of course, far superior to previous conditions. Living rooms contained a ‘Yorkist range’ (regularly black-leaded by respectable housewives) with a back boiler to heat water and an oven. 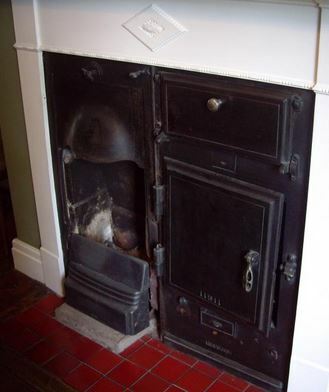 The working heart of the home, however, was the scullery with its Belfast sink, copper (a free-standing gas boiler for washing clothes) and gas cooker. A small pantry and coal store were situated under the stairs. Three bedrooms, a bathroom and inside toilet and large gardens added to what must have seemed luxury to many. By 1939, Hull’s scheduled slum clearance programme was largely complete but the devastation of the Blitz would cause the city’s rebuilding efforts to be redoubled in the years of peace which followed. Decades on, in 1991, the North Hull Estate would become the first Housing Action Trust – a sad fall from grace for what had once been ‘the Queen of the Estates’. We’ll take up those chapters of north Hull’s housing history next week. (8) As argued by Michael Young and Peter Willmott in Family and Kinship in East London, first published in 1957. I looked at post-Second World War planning in my book, Municipal Dreams: the Rise and Fall of Council Housing, mainly in the context of housing in which much was achieved. But there was another side to that idealism which lay in the ambition to rebuild and redesign the centres of Britain’s blitzed cities. There, as Catherine Flinn painstakingly describes in her important new book, the picture is far less positive. The worst phase of German bombing in 1940 and 1941 was reckoned to have destroyed 75,000 shops, 42,000 commercial premises and 25,000 factories. By the end of the war the total cost of destruction was estimated at £1,150m. And the practical, and what some saw as the moral, commitment to rebuild the worst-affected towns and cities in particular began early – as early as 1940 when a Cabinet committee on reconstruction was established. not just because of opportunities in restoration of damaged property but in the hope of a fresh start in a new spirit of cooperation and with the high objective of a better Britain. Flinn expertly charts the complex iterations of committees and ministries and legislation that followed but, throughout, the expectation remained that the blitzed cities would receive priority in the post-war era and that their reconstruction would indeed foreshadow and exemplify the new and better Britain to emerge. A whole shining world is possible. Is ours if we will. We are the shapers of our environment. We are the makes of our own destiny. We are the creators of our own happiness. If that was a rhetorical outlier, it was only partly so. When We Build Again, a film commissioned by the Cadburys in Birmingham in 1943 and scripted by Dylan Thomas, declared ‘Nothing is too good for the people’. And it’s interesting to note that in Britain, a country so often mired in tradition, that such plans were uniformly, in Flinn’s words, ‘modern, optimistic and forward-looking’ – an interesting contrast to Germany and Poland, say, where reconstruction often meant restoration. Thomas Sharp and his book Town Planning, published in 1940. It sold 250,000 copies – a clear sign of the public interest in post-war reconstruction. This range of promises of post-war betterment in a variety of forms and media is outlined in Flinn’s second chapter. It’s hard to disagree with William Holford, another planner and architect, quoted later in the book, that ‘it is true that not only the planners but the Government itself had promised, if not a new heaven, at least a new earth at the end of the war’. So, if you’re looking at the contemporary British city, you are probably wondering what became of this brave new world. With the significant exceptions of Plymouth (which I’ve written about in previous blog posts) and Coventry, the transformative impact of post-war reconstruction was paltry and often lamented. The rest of the book explains why. The simple and established answer is that post-war priorities rapidly shifted from physical to economic reconstruction. The great value of the book is not only to detail the processes by which this occurred but to delineate the myriad other obstacles to post-war rebuilding that facilitated this shift. Resources going to the blitzed cities would necessarily draw on precious needs for industry and other business relating to exports and economic recovery. Flinn also notes how a governmental ‘insistence on the maintenance of Britain’s world role’ and a ‘tendency to focus on global status diminished some of the discussions on the domestic agenda’. On the ground, the ‘overwhelming complexity in preparing and implementing reconstruction in the blitzed cities’ is amply illustrated by her three representative case studies of Hull, Exeter and Liverpool. Both Hull and Exeter had commissioned grand plans for post-war rebuilding, from Sir Patrick Abercrombie and Thomas Sharp respectively. Liverpool, by contrast, pursued a more in-house process in closer collaboration with interested parties. For all the differences between the three cities (in terms of history, local economy and political control), common themes stand out. The first and most crucial is the lack of central government support already noted, reflected not only in the issue of allocations (or lack of them) but in the sometimes obstructive, often critical attitude of Ministry officials who believed they knew better than councillors and planners on the ground. The proposals for a new shopping centre envisaged here by Abercrombie around Osbourne Street were scuppered by trader resistance. Beyond that, issues of existing property ownership and the competing financial interests they represented were uppermost. In Hull, for example, the Council’s vision was challenged by a rival plan put forward by the city’s Chamber of Trade in 1947. In the end, Flinn concludes ‘the Abercrombie plans were not only controversial but, in practical terms, impossible to implement’. Her forensic examination of the complex conditions operating in all three cities not only explains why so little was achieved but leaves you a little surprised that anything was built at all. With the new permanent buildings one gets the impression that only too frequently the architects have been overwhelmed with frustrations of all kinds, allied with problems of finance, leading to a building which is, at best, humdrum and lifeless. Rebuilding in Exeter, an historic city and victim of the Baedeker raids in April-May 1942, was described as ‘insipid’ and criticised by local residents. For all the subsequent disparagement of post-war rebuilding, it was decidedly not, in John Gold’s words, ‘the product of imposing utopia visions’. While council officials were able to some extent influence the overall look of new developments, practical issues around finance and rationing played a greater role in what went up. It’s true, however, that the sparse, clean lines of modernist design also sat somewhat uncomfortably with popular taste. Flinn sets out, in a broader sense, to examine ‘why cities look the way they do’. A large part of the answer in this instance, as explained in a later chapter which raises interesting questions for further research, lies in the role of private property developers. Here Ravenseft stands out; a company which began by building a small terrace of shops on a Bristol council estate and then expanded to develop large city centre schemes in Exeter, Hull and other blitzed cities. The firm was initially backed by Harold Samuel of the Land Securities Trust and acquired by that company in 1955. Landsec in its new incarnation is now the largest commercial property development and investment company in the UK. The lack of financial support from government and the pressing need to replace rates income lost to wartime destruction left local authorities dependent on such economic muscle. The developers themselves, of course, were more interested in lettable space than aesthetics. Flinn’s close empirical study provides much more detail, not only with regard to central government policy but also in relation to the local personalities, politics and issues in her three case studies. It is complemented by a range of relevant images – of plans, proposals as well as pre-existing and completed realities. As such, it is essential reading to anyone interested in post-war reconstruction as well as that larger question as to why our ‘cities look the way they do’. It’s an academic book and scholars in the field will be grateful for its apparatus of data and references. That means, of course, that it comes at an academic price and is probably out of reach to the general reader. But it repays study at your local library – or perhaps we can persuade the publishers to issue a cheaper edition for a wider readership. Catherine Flinn, Rebuilding Britain’s Blitzed Cities: Hopeful Dreams and Stark Realities was published by Bloomsbury on 27 December 2018. (Hardback, ISBN – 9781350067622). Follow the link for further information. That deep peace is now permanently invaded; for, however much we may minimise the ugly effects of industrialisation, and however well-planned the new additions may be, so as to conform to the genius of the locality, a change fundamental and complete will have taken place from the peace of the country to the busy hum of men. That ‘busy hum’ never quite had the impact anticipated by Abercrombie and others in the interwar years but it did, nevertheless, change significantly a bucolic corner of rural England. Though the last mine of the East Kent coalfield closed in 1989, a significant residue remains. This post and the next will focus on Aylesham, planned by Abercrombie, Britain’s foremost contemporary town planner, as a model settlement, and assess how successful these planning visions were. The existence of coal in the area – a continuation of the seams heavily mined in northern France – had been surmised for some time but was proven in 1882 when trail borings for the first, abortive, Channel Tunnel, were made under the Shakespeare Cliff in Dover. The Shakespeare Colliery, operational from 1896, was never successful – indeed, in a tragic reminder of the human costs of such enterprise, eight men were killed in an explosion in 1897 – and it was closed on the outbreak of the First World War. 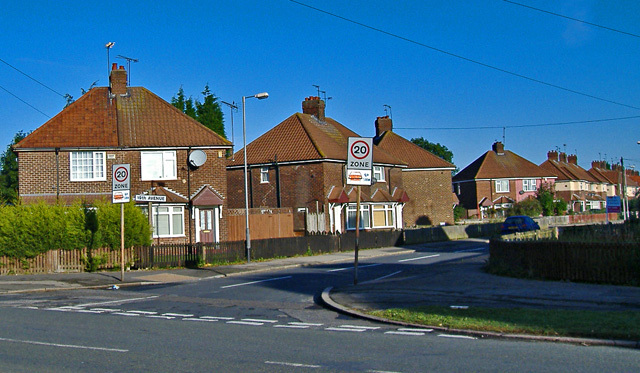 Milner Road, Elvington – larger homes built for colliery managers? Burr followed this up with a second pit, five miles to the west, at Snowdown in 1907. Twenty-two men were drowned when the first shaft hit water but, by 1912, the colliery had turned its first profit. A small number of miners’ houses were built in nearby villages but the pit closed for two years in the period of industrial slump and troubled industrial relations which followed the First World War. Purchased by Pearson & Dorman Long in 1924, an ambitious modernisation programme ensued, this time complemented by idealistic plans to create homes and community appropriate to the new, large workforce envisaged. It may well be that Coal and Iron in Kent is the biggest industrial happening in England of this quarter-century. Kent is not Durham or Lancashire or Glamorgan – distant spots glamoured in gloom: it is in the eye of the world. Coals in Kent are not coals in Newcastle: they are at London’s door. The first planning conference for the new coalfield took place in Canterbury in 1922, followed in May 1923 by an East Kent Joint Town Planning Committee meeting attended by representatives of the seventeen local councils directly or indirectly affected. As evidence of the interest of the Great and Good in planning matters affecting their backyard, a meeting, convened by the Archbishop of Canterbury, occurred in Lambeth Palace the following month attended, amongst others, by Lord Beauchamp (Lord Warden of the Cinque Ports), Lord Alfred Milner and John Jacob Astor, MP for Dover. background and, as both a Birmingham MP and, from 1924 to 1929, Minister of Health and Housing, a more informed and practical interest in planning matters. But his speech in 1926 captures the good intentions and nimbyism which characterised some of this anxiety around the East Kent Coalfield. You are getting away, on the one hand, from the straggling kind of development … and, on the other hand, from those pit-head villages which are an unfortunate feature of many of our mining areas. You are proposing a series of towns which are not to be at the pit-heads, but which are, nevertheless, near enough to serve them; and you can give the miners who will occupy these towns a social life of a far fuller, wider and more interesting character than they can ever hope to get in those mining villages in Wales. The nimbyism, not unreasonably, stressed that ‘the utmost care [be] taken to preserve as much as the rural charm of the hinterland (much used for charabanc excursions)’ – ‘it is easy to imagine how disastrous to them would be the background of a smoke-grimed and dishevelled Black Country’. Patrick Abercrombie – as a founder and honorary secretary of the Council for the Preservation of Rural England and professor of civic design at the University of Liverpool – commissioned by the Joint Town Planning Committee in 1925 to prepare plans for East Kent was exceptionally well placed to address these concerns. His first report, co-written with John Archibald, was issued in 1925. The report projected large-scale industrial development in East Kent: 18-20 pits and a mining population (including wives and children) of around 180,000. Associated steel works and ancillary trades were anticipated to bring a further 278,000 people to the area. Besides the necessary focus on new infrastructure, Abercrombie wrote at length on residential growth. This 1926 map shows the projected extent of the coalfield. He concluded that the ‘general result’ of company-developed schemes ‘would be deplorable’. He looked rather to the Garden Cities of Letchworth and Welwyn where Public Utility Societies controlled all aspects of planning and ensured land value gains accrued to the community. They were better, he argued, in providing public utilities and buildings as well as shops and entertainment. Existing pit villages were not romanticised in this analysis. ‘Of equal and, to many minds, superior importance to the economic gain of grouped sites’, he concluded, ‘is the opportunity they give for a fuller social life’. a simple Georgian, modified into a provincial touch with somewhat high-pitched roofs, and with a further local flavour of the Flemish influence in its brickwork. Aylesham, a new settlement next to the Snowdown Colliery and close to new mines envisaged (though never opened) in nearby Adisham and Wingham, was to be the canvas for Abercrombie’s grand designs. The Aylesham Tenants Ltd was formed, as a Public Utility Society, by Eastry Rural District Council and Pearson & Dorman Long in July 1926; Kent County Council joined in the following year. With a 600 acre site and £600,000 to spend – drawn in part from an Exchequer subsidy of £90,000, a £350,000 loan from the Public Works Loan Commissioners and £70,000 from a debenture stock issue – the company embarked on the construction of 1200 homes, envisaged as the first phase of a town planned to accommodate some 15,000. Abercrombie’s 1926 plan for Aylesham – the first built homes are shown in black. Housebuilding commenced in September 1926; the first four pioneering families moved in May the following year. The homes themselves did not live up to Abercrombie’s hopes. Of the first phase of 400, half were of traditional plain brick construction, half of steel-frame and poured concrete. The latter were heralded as an innovative means of building quickly and circumventing shortages of building materials and skilled labour. In Aylesham, their use probably reflected more the commercial interests of Pearson & Dorman Long whose Dorman Long Housing Company subsidiary was the chief promoter of such housing. Other facilities followed in relatively short order. A temporary school and library and Co-op had opened by the end of 1927 (when Aylesham’s population stood at around 1000). The first pub (the Greyhound Hotel) opened in January 1928 and Anglican, then Nonconformist and Roman Catholic churches all within the next year. As a marker of emergent community and workforce, the first parade of the Snowdown Colliery Welfare Band took place in June 1929. The centrepiece new Central School opened the following year. The town, however, remained embryonic and parts had a desolate air. These were early days but what form of community did emerge and how fully and how successfully were the grandiose plans for Aylesham and the East Kent coalfield fulfilled? Next week’s post takes the story forward. (4) Patrick Abercrombie and John Archibald, East Kent Regional Planning Scheme Survey (University Press of Liverpool and Hodder and Stoughton, 1925). Later quoted detail is from this source. Kent History and Library Centre have produced an excellent timeline of Aylesham’s history which is worth consulting for further detail and illustration. Council Housing and Community in Beverley: ‘from bad to worse’? Last week’s post concentrated on the built history of Beverley’s council housing – some 539 council homes provided before the Second World War and a further 1332 by 1964. These post-war decades were, perhaps, the heyday of council housing. This was an era when it was seen as aspirational housing, an undeniable step-up from the far lower quality privately-rented homes from which most people were moving. But some said the new estates killed traditional working-class community whilst others, contradictorily, have lamented its more recent decline. Beverley offers an opportunity to examine this vexed question, which suffers a surfeit of ill-informed commentary, more objectively. You could walk down [Schofield Avenue] and it was a picture and included in that was a bit of competition. If Mrs next door cut her grass, well, that one cut grass and Mr Cooper that lived opposite he would cut his hedge, you know, and then he’d come to our side and look…every garden was all clean, tidy…swept and everything, it was lovely. an old spinster…she knew everything did Miss Christie; she used to walk around the estates on foot, looking over walls and gardens and peering through windows. She stood for no nonsense. She certainly could evict people with no compunction at all, what she said went. Gardens had to be kept, she would not tolerate gardens or fences being run down. Curtains that were not clean and if things looked shabby she would knock on your door. If that makes Miss Christie sound like a termagant, we should remember her other side: ‘if she saw anything wrong, she told ‘em they’d to get it done, really cared about the tenants, she really looked after them’. 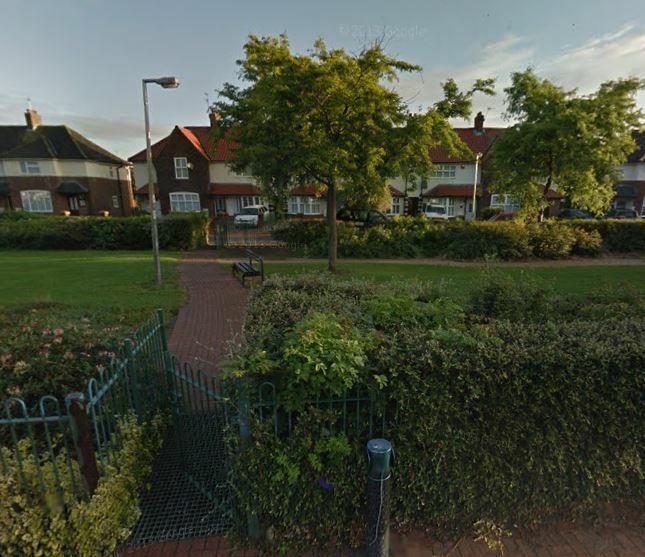 A resident who moved to Greenwood Avenue in 1940 recalls the Cherry Tree Estate as ‘a rough area…quite rough for people like…not well-to-do, not well-off’. This may reflect the fact – though it is not referenced in his comments – that this 1930s estate very largely accommodated those rehoused from central slum clearance areas. (The same critical assessment was applied, in a similar context, to the Filwood Park Estate in Knowle West, Bristol.) Generally, estates had, to this point, housed the better-off working-class whose stable employment enabled them to pay higher council rents and some established residents looked askance at these poorer incomers. They didn’t make trouble, maybe a bit of scrumping, maybe a bit of a battle with the people off Schofield Avenue area…You maybe had the odd scrap or something, the odd falling-out, but there was nowt serious, there was no pinching, no thieving or owt like that. And you didn’t damage or break things. That the Council has acted to ‘design out crime’ by closing off some of the back passages that formerly ran behind houses suggests either some rise in more serious anti-social behaviour or less tolerance for behaviour that, whilst not accepted, was once dealt more informally. This narrative of decline brings us back to the question of council estates and working-class community. There have, in the first instance, been objective changes. Stefan Ramsden notes the desirability of council housing in the early post-war decades but, by the 1960s as home ownership became more affordable, council housing acquired a lower status. I think because you got a stigma with it…you were seen to be a lower class of people if you were in a council house. I don’t know why but that’s how it appeared to be…in the sixties… And the amount of people round about us that did the same thing…moved out. Later, in the 1980s, others would buy their council homes and create something of the same status division within estates. Those still renting from the Council or from a housing association (in Beverley, now around nine percent of all households) were typically less skilled and proportionately more likely to be unemployed or on some kind of benefit. A broader perspective has accused council estates themselves of destroying working-class community but in Beverley, at least, both the oral histories and academic analysis suggest its estates were once highly sociable and ‘friendly’ places. Stephanie Fish describes one annual highlight – the bonfire nights in Hotham Square (albeit ‘often “raided” beforehand by the neighbouring Cherry Tree Estate gangs’) – and the regular social events held in the local parish hall or in the Co-op’s rooms above its Grovehill Road shop. The Goth’s Lane Estate seemed very different to Hotham Square which is all straight lines and compact, whereas the Goth’s Lane Estate is all curves and wide spaces. In some ways this is very desirable, but I think it loses some of the ‘community spirit’ which are my happy memories of Hotham Square. At any rate, Beverley’s estates were in overall terms highly sociable places. It’s worth taking note of this when council estates have been so routinely and readily criticised as killing off just that ‘community spirit’ which allegedly resided in the ‘close-knit’ terraces from which so many of their residents moved. In places like Beverley, where new council estates were not so far from the old streets and where traditional industries entered a boom period in the post-war decades, this was a period in which local community had palpable meaning. Industrial workplaces continued to offer sufficient quantity and quality of employment to keep many young people from leaving the town, and therefore individuals’ local social networks were often a palimpsest of relationships and acquaintances built up over a lifetime. But what Ramsden also notes is a labour market which broadly fulfilled working-class needs. Ironically, it was the very success of the post-war economy with its full employment and rising living standards that brought about the ‘affluence’ so often considered as having killed off ‘working-class community’ in favour of more privatised and domesticated life-styles. The negative view is summed up by the chair of the Swinemoor Residents Association: ‘[The estate is] far less community driven, far less friendly. Cosmetically it’s a lot better but there isn’t the neighbourhood feeling there used to be’. It’s tempting to view the hedges and fences erected in Sigston Road noted in last week’s post as some kind of symbol of this and it’s true, as Ramsden’s detailed analysis substantiates and conventional wisdom suggests, that working-class men did begin – putting it crudely – to spend more time at home with their wives and children and less time at the pub. It’s true also that informal forms of neighbourly self-help declined as rising living standards and state agencies such as the National Health Service catered for needs previously met informally. Perhaps it’s unfair to suggest that only romantics or revolutionaries lamenting the loss of an idealised working-class community rooted in the fundamental inhospitality of slum living would view these changes as a bad thing – but only a little. The decline in older-style neighbourhood sociability and mutuality was compensated by new forms, frequently conducted between relatives and friends who did not live on the same street but were scattered across the town. In the final analysis, what we see is not ‘increasing “privatism”’ but ‘a more expansive sociability’ though one in Beverley still ‘anchored in locality’. We’ve ended up at some distance from the bricks and mortar of council housing’s prime achievement in this Yorkshire town as elsewhere: the provision of good and affordable homes for the many who needed them. But it is, in my opinion, a necessary digression when so many of society’s supposed ills are laid at the door of what was in reality one of our greatest achievements. My thanks to the East Riding Archives and Local Studies service for making the older photographs credited here and in last weeks post available on a Creative Commons licence. You can find other historic photographs of Beverley and the surrounding area on their Flickr page.